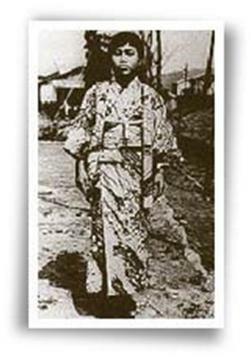 Sadako was two years old when the atomic bomb was dropped on Hiroshima. She was two kilometres away from where the bomb exploded. Most of Sadako's neighbours died, but Sadako wasn't injured at all, at least not in any way people could see. One day Sadako became so dizzy that she fell down and couldn’t get up. Her school-mates noticed and informed the teacher. Later Sadako’s parents took her to the Red Cross Hospital to see what was wrong with her. Sadako found out that she had leukaemia, a kind of blood cancer. Nobody could believe it. At that time they called leukaemia the “A-bomb disease”. Almost everyone who got this disease died, and Sadako was very scared. She wanted to go back to school, but she had to stay in the hospital where she cried and cried. Every one was very sad. Thirty-nine of Sadako's classmates felt saddened by the loss of their close friend and decided to form a paper crane club to honour her. Word spread quickly. Students from 3,100 schools and from 9 foreign countries gave money to the cause. On May 5, 1958, almost 3 years after Sadako died, enough money was collected to build a monument in her honour. 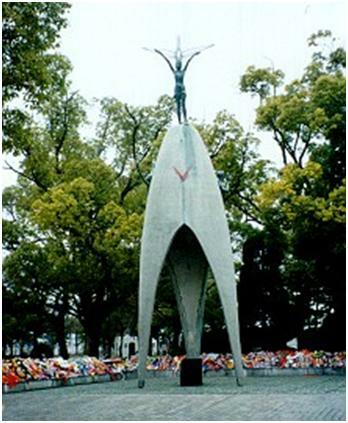 It is now known as the Children's Peace Monument, and is located in the centre of Hiroshima Peace Park, close to the spot where the atomic bomb was dropped. Many of the children who helped make the Children's monument a reality participated in the ceremony. Three students, including Sadako's younger brother Eiji Sasaki pulled the red and white tape off the statue to symbolize its completion, while Beethoven's Seventh Symphony was played. The little bell, contributed by Dr. Yukawa, inscribed with "A Thousand Paper Cranes" on the front and "Peace on Earth and in Heaven" on the back, rang out and the sound carried as far as the A-bomb Dome and the Memorial Cenotaph. "This is our cry; this is our prayer, Peace in the world".